We said goodbye to a member of the family when we closed our parlor. On January 20, 2017, we hung up the milkers in our parlor for the last time. Luckily not for the reason that seems to currently plague our industry – having to call the dairy quits. Rather, we closed the parlor for the future so we could switch to robots milking our cows. 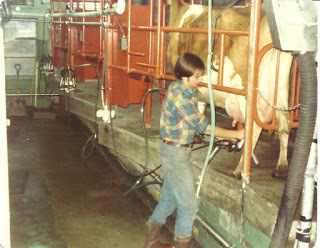 As the last cows left the parlor and we moved them to the new barn, I was remembering fondly the history of our parlor. Throughout three generations and 59 years, twice a day, morning and evening, a member of our family stepped foot in the parlor. That marked 20,917 days (approximately) and 41,833 milkings that our routine had been nearly the same. My grandfather completed the first half of the parlor in October of 1958. To celebrate, my grandmother threw a surprise “barn warming” party for him. Back when newspapers reported on social events, this party was covered, here’s what was said about the event. That clock hung in the parlor for many years. And the parlor again saw changes as my father joined the operation. 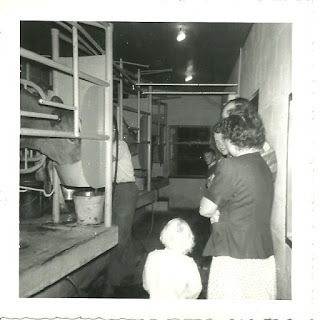 On May 20, 1977, additions and remodeling to the milking parlor were finished, with double the milking stalls and a new milk tank! Lorna was the first cow to be milked on the new side. My grandfather milked for the last time on the day I was born. My parents spent every milking here until I joined the operation 20 years later. This double-3 side-opener is the same parlor we milked in for the last time this past week! I’m not going to lie; it's a bit emotional for the whole crew to step away from the center of our success for so long. The parlor truly is the heart of the farm. And while each farm’s history is unique and special, I know we all cherish the memories made in the parlor.